We evaluated the service impact of the Creatively Cooperative project by the Edinburgh Development Group (November 2018 – January 2019). We interviewed service users, project partners and project managers about the delivery and impact of the project. We delivered a high quality video with interviews and also a short summary animation for Social Media. We have developed 40 videos for the What? Why? Children in Hospital charity. The videos prepare children for tests such as ECG, Echo and Sleep Studies (August 2015-January 2019). This is an example of our work ‘What happens when my child has an ECG?’ This video helps to reduce anxiety in children and parents when they need to visit the hospital to have their heart checked. This project was funded by The Scottish Government. The video shows elderly patients how to correctly use their inhaler and how different inhaler devices can overcome problems with coordination and breathing strength. Going2Hospital videos show hospital tests and treatments in the adult hospital. Not knowing what is going to happen or how to use equipment can make patients very anxious (June 2018-January 2019). For the Leighanne Easton family we developed a series of videos sharing the experiences of young people with brain tumours to help raise awareness of the early symptoms of brain tumours (May 2018-November 2018). 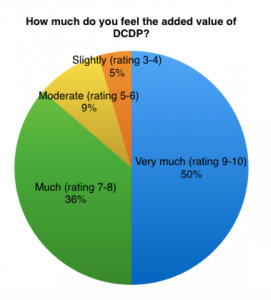 For the DCDP project we analysed the impact of a new funding initiative. Project partners were asked to rate the project’s impact in a 10 areas of work in a quantitive survey and qualitative interview (October-November 2017).